We are SO excited to announce that, after quite a bit of work, we’ve cut, sewn, twisted, built and perfected a series of new cake and cupcake toppers! They are all currently available in our shop, here. If you have something slightly different in mind for your celebration, please don’t hesitate to let us know. 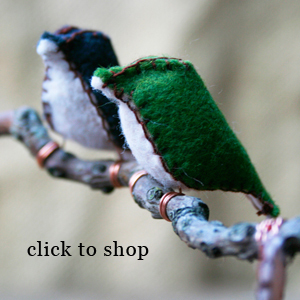 We have an array of felt colors, unlimited branches, and we love building customized pieces! This entry was posted in Etsy Wondrousness and tagged birds, cake-topper, cupcake, felt, new, sewn, topper, trees, wood. Bookmark the permalink.